Since 1910, the Iwig family has been raising healthy cows and producing delicious, high quality milk for Kansas families. In 2004, Tim and Laurel took the family dairy farm to the next level with the opening of its dairy production, bottling and retail service, providing bottled milk to grocery stores throughout Kansas. And not just any milk, but the highest quality milk available. 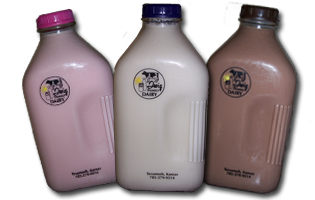 Iwig Family Dairy is a Kansas dairy, and local milk is always fresher than milk that has been trucked-in from a national milk processing plant. The shorter distance between the dairy and your grocery cooler, the fresher the milk will be! We take excellent care of our cows – and we’re very proud of them. Happy, healthy cows make higher quality milk! Secondly, our special pasteurization process yields better taste than the larger processing plants. And last but certainly not least, it’s the glass bottles! Many people don't realize that milk in plastic bottles take on the taste of the plastic. 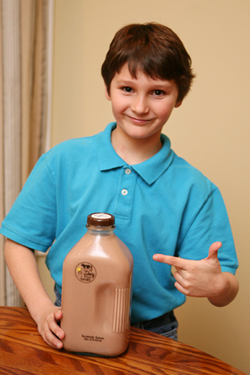 Plastic has chemicals in it that will seep into the milk and alter the flavor. Glass, on the other hand, preserves the natural taste of the milk. Our milk is free of rbST and rbGH injectable hormones. It is also free of any antibiotics, and all the milk that we use comes straight from our own dairy cattle. When you buy Iwig milk products for your family, you are not only assured quality, delicious, natural and healthy milk, but you are supporting a homegrown Kansan family business. Iwig Family Dairy is owned and operated by a multi-generational family farm operation in Tecumseh, Kansas, and supporting family farmers in Kansas is good for your state’s economy! Why support corporate milk producers in other states when you can support agri-business right here in Kansas?